Indeed, for many artists this certainly has been the case. It’s easy to find success stories where musicians made an impact outside of traditional gatekeepers influence. But what’s harder to see are the limitations of online music discovery, and the ways that the same powerful industry players dominate the space, replicating some of the very bottlenecks found offline. Even the counternarratives tend to be more complex than many imagine. In this context, how free are consumers to discover their own taste preferences? Consumers have no way of knowing whether recommendations and curated playlists are based on curatorial choices, or whether big money tips the scales. Practices and policies vary, but when you see an artist featured in a splash ad on your favorite service’s homepage or a “personalized recommendation,” it may be bought and paid for by a big label or offered as a pot-sweetener. And this could be true even if you’re a subscriber paying for an advertising-free experience. Part of this ambiguity stems from a lack of oversight. The Communications Act requires that broadcasters must disclose “if matter has been aired in exchange for money, services or other valuable consideration,” making undisclosed payola illegal on AM/FM radio. But when it comes to online services, regulatory agencies such as the Federal Communications Commission have no jurisdiction. Meanwhile, the Federal Trade Commission regulates advertising practices, but has very limited say over most of what goes on in a retail environment. It’s important to understand that this dynamic isn’t new. Historically, in physical retail environments, large window displays and primo shelf space is afforded to releases where a label or distributor made financial arrangements with the retailer, not just because the staff of Sam Goody decided that they really liked Stone Temple Pilots. But music services often encourage us to think of ourselves as the architects of our own online experiences. When making our playlists, to what extent do digital services really take our preferences into account vs. the preferences of advertisers? Far fewer noticed that all the artists involved were associated with major label Universal Music Group (hat tip to Jody Griffin from Public Knowledge, who first brought this to our attention). There’s no way to know what deals are involved, but at the very least it stands to reason that the service could be building an evidence case to charge labels for this kind of promotional support in the future. Universal is likely to be happy with the results, as they saw a 75 percent jump in streaming revenue last year, outpacing industry averages. Now that the latest Spotify “Spotlight” round has been announced, we see a slate of up and coming artists who will benefit from extra Spotify promotional muscle. For whatever reason, at least 7 of the 16 acts are signed to Universal Music Group subsidiaries. Perhaps you find these recommendations easy to ignore. But just as the ratio of “organic” content to advertiser-driven content delivered on Facebook has shifted over time, it’s easy to imagine some digital music services could move further in this direction. Will indie artists be able to cut through the noise? Will indie labels be able to afford to compete if digital payola becomes the new standard? Solutions aren’t easy to come by, but it does seem fair to ask that digital music services be held to the same level of transparency and disclosure as AM/FM radio. At the very least, services should recognize that a recommendation engine and user interface untainted by paid placement might be something to brag about. 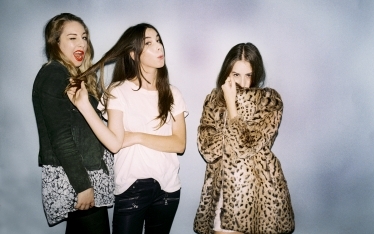 Photo: HAIM, one of the first artists in Spotify’s Spotlight, by Bella Howard courtesy Big Hassle PR. Submitted by T. Lambert (not verified) on June 12, 2014 - 4:24pm. Great post Kevin! Love the call for transparency and functions that benefit the artist. Need to take a real look at artist revenue streams.